Here are two examples of how to provide attribution — author’s name, copyright status, source — on an image. The first is just to use white text. Situate it either horizontally or vertically (it doesn’t matter). The second photograph show the attribution inside a black bar. Again, it can be horizontal or vertical. I favor the black bar model because the text is fully visible without needing to fuss with font color, shading, etc., for every single slide. It’s also aesthetically simple — if displayed in a dark room the bar just blends into the dark part of the display screen. Click on an image to view large. NB: you can get the copyright symbol via this page; or just type, “copyright”. When you find a photograph via an online search, it’s usually not clear who took it. But you should figure it out. To track down the name, try Jeffrey’s EXIF viewer, Tineye Reverse Image Search, and Google Inside Search. I highly recommend installing EXIF Viewer and Tineye browser extensions if you use Chrome. If you can’t find the name, find a different image to use. Aim for a talk in which every image has a credit. You might initially have found a great image on Pinterest or Twitter, but using the search techniques above you should track down the URL for the original on the photographer’s website. Displaying the URL (1) shows that you respect the photographer’s work enough to track down the original, (2) gives you a way to revisit the image should you require additional photographs from the same photographer, (3) gives others a way to track down the photograph if you share the talk slides with a colleague, and (4) provides audience members the source information needed if they wanted to visit that photographer’s site. In regards to function #1, it’s not a rare situation to have the photographer in the audience, unbeknownst to you. If you have done everything in your power to honor that photographer’s work, he or she is going to be pleased. If the original is in a book or magazine article, provide that source information in place of a URL. Again, if you can’t be bothered to track down the source information, don’t use the image. Photographers spend tens of thousands of dollars on fancy equipment and spend years accumulating quality shots, so honor that effort. Don’t be a parasite. 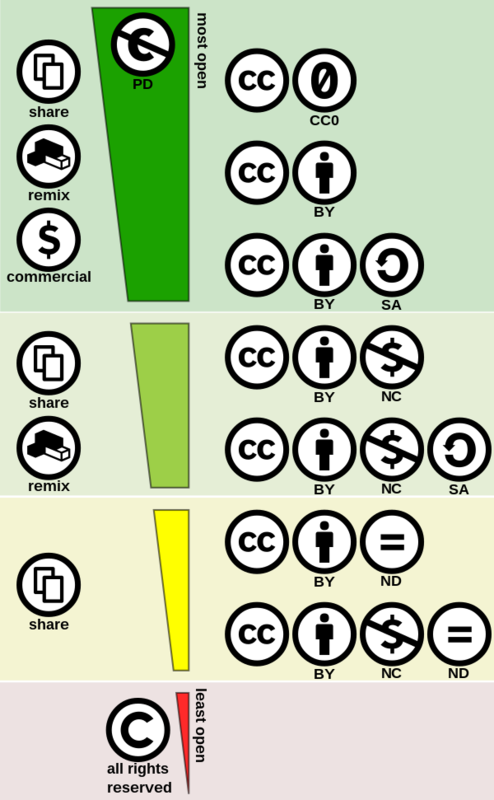 In addition to plain copyright (©), photographs and illustrations can be marked with a large number of icons to indicate what type of usage the owner permits. Icons can also indicate that the image is so old that copyright has lapsed. Adding the correct icons can be a pain (there’s a font), so use the letter-code equivalents as described here. Below is an overview of the icons (image from Wikipedia). Note that you can search for images with particular usage settings with any of the search engines listed here. If you regularly use the internet to find images for lectures, consider installing a Creative Commons browser plugin to facilitate those searches. As always, if you’re unsure of the copyright status of an image, assume that’s it’s fully copyrighted. It probably is. If you have a room full of impressionable students, please pause once during your lecture to comment about why image credits are displayed. Explain that, yes, it does take some time to track down information but that it’s important to do so, just like using quotation marks and sources for copied text. Make it clear that providing image credits is, indeed, part of the academic honesty policy of your school. And make sure “add image credits” is on your syllabus if you require students to make presentations of their own. If you don’t include it on your syllabus students will not do it. Is it OK to post your talk slides online? If you have used copyrighted photographs or illustrations, the answer is “no”. The answer is the same if you are an academic at a non-profit institution. I.e., although you can claim “fair use” to include copyrighted visuals in a presentation without getting permission from the creators, current United States copyright law does not allow you to publish those images, even if you think that’s part of your job. So if you promise your students “I’ll post these slides online later”, you are legally required to delete the copyrighted images before doing so. Note that this prohibition against publishing other people’s copyrighted work applies even if you post your slides on a content management system like Blackboard, Moodle, or Google Classroom. Sorry, I’m just the messenger here.